Using the new Premium Members Area, simply send your Profile to your potential clients, existing clients, professional services, industry associations; to anyone and everyone in your commercial network. On the Dashboard you’ll find the Premium Members Area button linking to a central store of all your Premium member features. 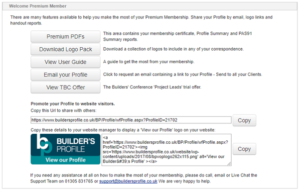 The ‘User Guide’ gives lots of tips on the premium membership features and highlights how the Profile is promoted to main contractors and clients. Our Support Team are on hand to help with any questions at all.